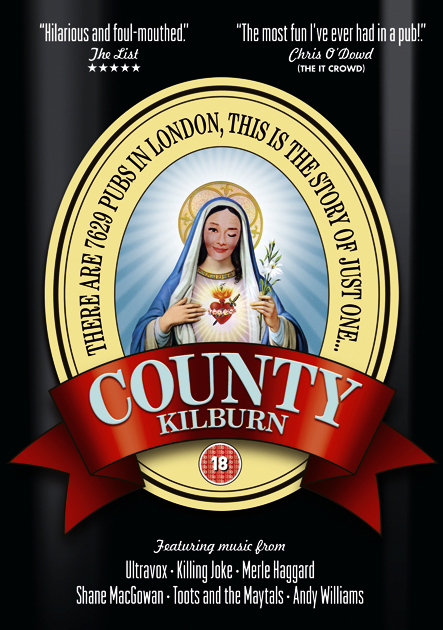 Drawing its inspiration from bar led comedies such as Cheers and the caustic humour of Father Ted, Elliot Hegarty’s County Kilburn is the funniest film about the Irish in Kilburn ever made. Along the kilometre stretch of Kilburn High road, there are twenty-eight pubs: that’s one every thirty-six metres. Populated predominantly by the Irish, this area has come to be known as County Kilburn.Here we witness the loves, lives and laughs of a disparate group of dreamers, losers and ever hopefuls. Elliot Hegarty has since become one of TVs sharpest comedy directors with shows such as ‘The Kevin Bishop Show’ and ‘Star Stories’. Featuring music from – Ultravux, Killing Joke, Shane MacGowan, Merle Haggard, Andy Williams and Toots and the Maytals – and a guest appearance from Paul O’Grady. Titles licensed exclusively to Blue Dolphin for theatrical distribution in the UK. All films can be ordered direct from Blue Dolphin. Payment by Postal Order, Cheque or PayPal. Please contact info@bluedolphinfilms.com for more information. BLUE DOLPHIN IS THE REGISTERED TRADE MARK OF BLUE DOLPHIN FILM PRODUCTIONS LTD. ALL RIGHTS RESERVED.